The more powerful your hero’s armor and weapons are, the easier it will be to defeat multiple enemies and boss monsters. If you get a powerful weapon or items via tribute, loot or as a reward, head straight to “Inventory” and select the new item to equip your hero with it. Before equipping weapons or items like boots, armor or helmet, make sure their stats are higher than the current equipped items. You will clearly see the green up arrow below each weapon or item icon. This indicates that the new items are stronger the new items currently equipped. Not all items collected as loot or rewards can be equipped. These items will have a red “X” icon on top of them. You can equip them only after your hero reaches a certain level. To make things easier for players, the game categorizes each item under “Head”, “Weapon”, “Shoulder”, “Neck” and other categories. Tap on a category located at the top of the Inventory screen to access them. You will usually find loot scattered on the ground soon after defeating a mini-boss in every stage. Collect them immediately before the 5-second timer runs out. Redeeming tribute tokens is another way to earn them. You may earn these tokens as level-completion rewards or via daily login bonuses. GS or the Gear Score shows the combined score of your equipment. You can see the total GS at the top-left corner of the screen, just below your character profile pic. To increase your GS, you will need to fuse items to make your weapons stronger or evolve them. Replay previous missions to collect loot. The gathered loot can then be used for fusion or evolution procedure. To access previous missions, tap on Battle in the slider menu and choose a mission to play. You don’t have to stick to one hero in every level. You can choose another hero every time you open a game. The only drawback is that you have to start from scratch. The game gives you a chance to experiment with different heroes and their skills. After playing with all 3 heroes, choose the one that you think can inflict max damage to enemies. I personally found Barbaress quite better at dealing with multiple enemies than Warlock, although Warlock is more swift-footed than her. Barbaress throws axes from a distance, which ensures that slow-moving enemies get killed before they can come too close to her. I just press and hold the attack button or tap repeatedly to make sure enemies don’t come closer to my character. I love Barbaress’s Hunting trap, as it helps me to dodge and move back while placing a trap right in front of enemies. However, care should be taken when you confront arena enemies that launch projectiles or throw spears from a distance. In such situations a Warlock or a Gladiator would be a better choice. You may stick to another hero of your choice, but make sure you play all three heroes, note down their strengths and weaknesses against enemies and continue with the one whose attacks and defenses trumps others. Blood & Glory: Immortals allows players to fuse items to make a weapon stronger. To do this, go to “Inventory” and select an item that you want to upgrade. Tap on Upgrade > Fusion. Next, tap on the empty slot and choose duplicate items (an obsolete weapon or a helmet) or a bludgeon. 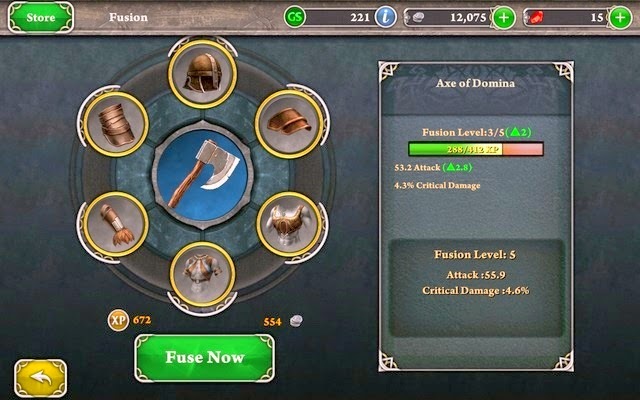 You may select multiple items or single item to fuse, although choosing the former will make your weapon stronger. The ones you can’t choose will have an “X” mark on top of their profiles. Choose the ones that have a red Down symbol below or are duplicates of items that you already have. Don’t choose those with a green Up arrow symbol. Keep an eye on the Skills menu. When a number is shown above the menu, it means a skill is unlocked and ready to use. Tap on the skills menu and then tap on learn. Upgrading skills requires gems or coins. But first you should reach a level to learn it. Better wait until your hero reaches that level and use coins to learn a skill instead of using gems as the latter is hard to earn. You can earn free health and energy potions by watching videos. You may get these pop-ups soon after you complete a mission. But such offers are shown when you have killed a boss monster while taking less damage and scored a B or A grade. Tap on the Watch video button to watch a 30 second clip to get a free health or energy potion. When enemies appear, the surrounding area gets locked. It gets unlocked when you have killed all of them. But wait, don’t just leave the current area. 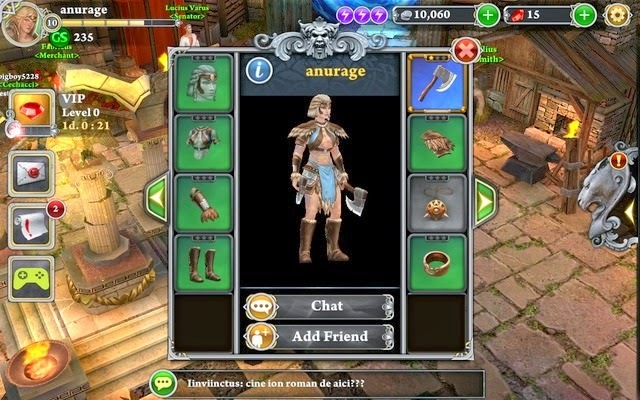 Explore a bit and search for crates, treasure chests and barrels. Destroy them to collect coins and gear. You may even get a common or uncommon item, although several times these objects don’t return anything. Besides fusion, there’s another way to upgrade your weapons and items – Evolution. Go to inventory, select an item and tap on upgrade. Choose evolution this time. Evolution requires materials like reagents, which can be collected by finishing off bosses with less damage. You will need to fulfill the number of required regents before you can start the item evolution process. Also, you will need to fuse your item to max level before you can evolve it into a more powerful item. So go and fuse spare, obsolete or duplicate items multiple times, reach maximum fusion level and then come back to complete the evolution process. 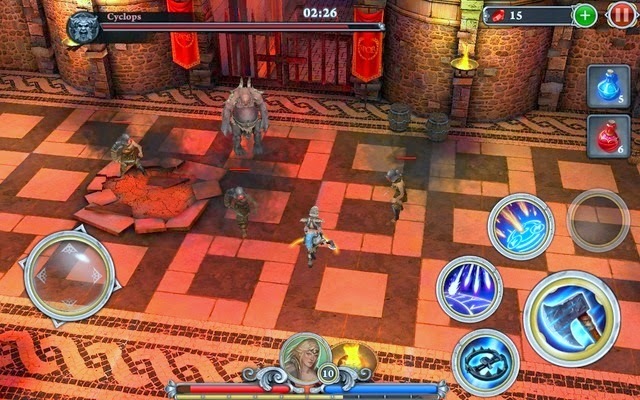 All heroes have defensive skills, which can be used to dodge enemies. Use them against bosses, especially the ones that charge at you. Use area damage skills for bosses that attack from a distance or go closer to them to avoid getting hit by their projectiles. You may have to wait for Active skills to replenish so that you can use them again. Just wait for a few seconds soon after you have killed all enemies in one area. Don’t just rush to another area. Of course it would mean a low grade at the end of the battle as you will be taking few extra seconds to wait for active skills to complete cool down, but it can be extremely helpful, as you would be facing tougher enemies in a new arena.